A pregnant woman usually never forgets an ob-gyn appointment, but visiting the dentist while pregnant can easily get put on the back burner. Some don’t even bother to see a dentist during their pregnancy. A dental checkup is important and safe during pregnancy. This assures you of getting healthy teeth while pregnant and get help from your dentist with any pregnancy-related dental symptoms that you may experience. The American Congress of Obstetricians and Gynecologists, the American Dental Association, and the American Academy of Pediatrics encourage pregnant women to get dental care. 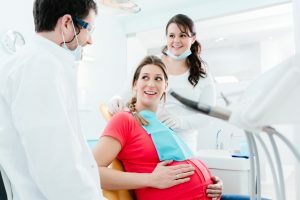 What Should I Tell My Dentist While Pregnant? Both your dentist and ob-gyn may recommend postponing some treatments if you have specific medical conditions or having a high-risk pregnancy. Several women may not experience any dental discomfort during the course of their pregnancy, but some women do. It may be a case of an existing dental condition that can worsen while pregnant or pregnancy may create new dental issues. A regular checkup and good dental habits will keep you and your baby healthy. Gingivitis. Hormonal changes can affect your mouth. Some pregnant women experienced tenderness and inflammation of the gums. Known as “pregnancy gingivitis,” there may be a small amount of bleeding on the gums when brushing or flossing. This can lead to periodontal disease if untreated. Regular cleaning is recommended by a Hilliard dentist. High Incidence of Tooth Decay. A pregnant woman may be more susceptible to cavities due to high intake of carbohydrates. Acid in the mouth also increases because of morning sickness, and that leads to enamel depletion. Some pregnant women may not feel like brushing or flossing because of morning sickness, gum tenderness, a more sensitive gag reflex, and exhaustion. Regular brushing and flossing are essential during pregnancy to prevent premature delivery, gestational diabetes, intrauterine growth restriction, and preeclampsia. Overgrowth of Tissue. Some pregnant women develop overgrowth of tissue, also known as “pregnancy tumors.” This appears on the gums, particularly during the 2nd trimester. It may be linked to increased plaque and is not cancerous but merely swelling that occurs between teeth. “Pregnancy tumors” are color red that looks like a raspberry and bleed easily. They usually vanish after giving birth. Talk to your dentist if it worries you, so they can be removed. Visiting your Hilliard dentist while pregnant is not only good for you but for your child, too.